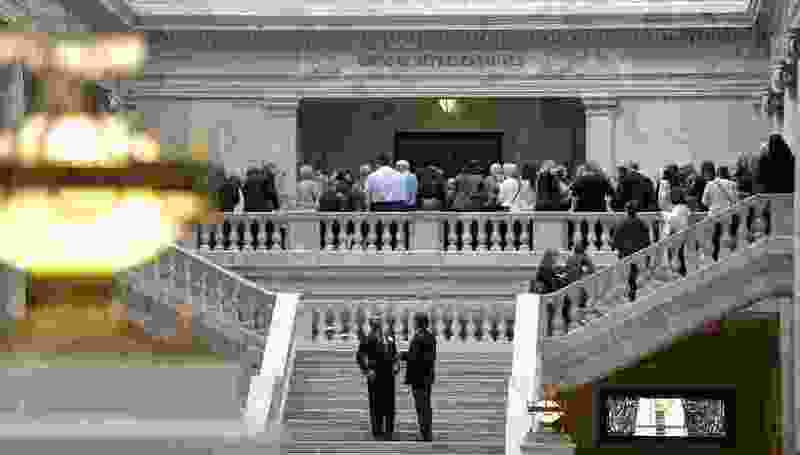 (Al Hartmann | Tribune file photo) Citizens and lobbyists waiting to bend the ear of their legislators crowd the entranceway to the Utah House of Representatives Thursday February 13. Earlier this month, lobbyist, UtahPolicy.com publisher and Deseret News columnist LaVarr Webb reached out to Sen. Jerry Stevenson, R-Layton, in the hopes of scheduling a five-minute sit down, according to an email obtained by The Salt Lake Tribune. The purpose of the meeting was two-fold, Webb wrote: to pick Stevenson’s brain for an upcoming column, and to deliver a campaign check from one of Webb’s corporate lobbying clients. Sen. Jim Dabakis, D-Salt Lake City, said the email is indicative of the “back network” that operates around state government. Dabakis provided the email to The Tribune after an anonymous person slipped it under his office door, Dabakis said. A lawyer might argue that no legal lines were crossed, Dabakis said, but the people of Utah know it’s not right to hold out a campaign contribution while asking for an interview with a man who oversees the state budget. Stevenson and Webb both confirmed the authenticity of the email, and that no such meeting had yet taken place and no contribution was made by Webb’s corporate client. Webb was adamant that his email was not intended to buy access to a lawmaker. He said he regularly meets or talks with lawmakers to gather information for his website and columns. Rather than request a single meeting for both lobbying and journalistic purposes, Webb said his email was intended to send a single request for two separate discussions. In the email, Webb went on to applaud Stevenson and other legislative leaders for their long-term and “visionary” approach to the state’s challenges. He then suggested the meeting with Stevenson — the Senate’s budget chairman — could occur during November’s interim meetings at the State Capitol. Stevenson said he’s routinely asked about his budget priorities, by Webb and others, and that his answer is always the same. “I want to see a balanced budget at the end of the session,” Stevenson said. He added that he is particularly cautious and respectful toward Utah’s campaign contribution rules. He would never accept a contribution on Capitol Hill, Stevenson said, and tries to keep both the letter and spirit of the law. “I would not cross the street and take the contribution either,” he said. Dabakis said Webb’s relationship with the Deseret News, which runs a weekly column by Webb and fellow lobbyist Frank Pignanelli, adds to his concerns regarding the email. Webb is a former managing editor of the Deseret News and was a policy adviser and campaign manager for former Gov. Mike Leavitt. Pignanelli was minority leader of the Utah House. Deseret News editor Doug Wilks did not immediately respond to multiple requests for comment.